The global hadoop market is consolidated, as few players hold maximum share in this market. Leading players are acquiring smaller companies to strengthen their position in the market. For instance, Google acquired Cask Data that designs solutions to operate big data analytics services with the help of hadoop. This acquisition will benefit both companies and will further strengthen position of Google. Moreover, these players are investing heavily in research and development activities to develop their own version of hadoop software. They are also focusing on developing advance Hadoop-based data management, storage, and analytics solutions to the met the growing demand for various business enterprise. In this report, analysts have profiled prominent players such as Hortonworks Inc., Cloudera Inc., MapR Technologies Inc., IBM Corp, and EMC Corp. According to the data published by Transparency Market Research, the global hadoop market is like to witness significant growth, as the market is expected to rise at excellent CAGR of 29% over the projected period between 2017 and 2023. The marker is also anticipated to achieve US$37.75 bn by the end of 2023. In 2017, the global hadoop market earned US$8.16 bn. The demand for hadoop software is likely to increase significantly in the coming years. This growth is attributed to the rising investment in developing advanced hadoop software to cater growing need from various industry verticals. Geographically, Asia Pacific is projected to lead the global hadoop market in the coming years. Increasing deployment of hadoop big data solutions in various enterprises is the key reason behind the significant rise for hadoop in Asia Pacific region. Rapid growth in data collection has simultaneously increased demand for hadoop big data solutions. This is the prime factors for increasing demand in the global hadoop market. Various organizations are deploying hadoop software to analyses this data collected from different organic and inorganic sources. Increasing investment for expanding capabilities of hadoop software has also fueled growth in this market. Moreover, key players are focusing on launching next-generation services and solutions through technologically advancing hadoop big data analytics. These developments will enhance real-time analytics and improve hadoop security integrations. Additionally, increasing demand for cost-effective and faster data process techniques is likely to further accelerate demand in the global hadoop market. However, rising data security issues along with immature technology framework are expected to deter demand in the global hadoop market. Shortage of qualified and experienced professionals is another factor hampering growth in this market. 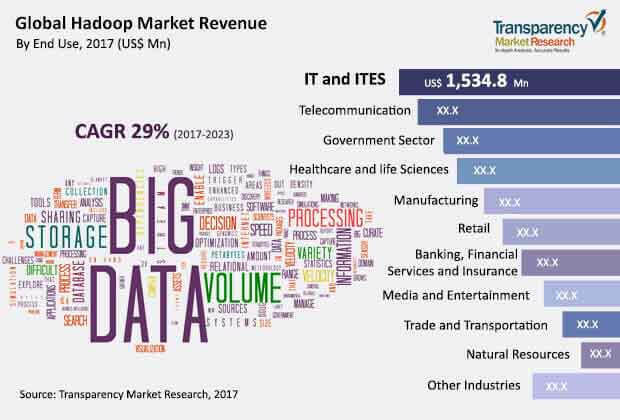 Moreover, high cost of training and services and other primary stage complexities are also expected to challenge growth in the global hadoop market. despite these restraints, hadoop is widely deployed in various sectors including media and entertainment, banking, financial service and insurance (BFSI), retail, manufacturing, telecommunications, government, healthcare and life sciences, trade and transportation, natural resources, IT and ITES, and others. Rising applicability of hadoop software could help in overcoming these challenges. The study presented here is based on a report by Transparency Market Research (TMR) titled “Hadoop Market (Type – Software, Hardware, and Services; End use – Banking, Financial Services, and Insurance, Retail, Manufacturing, Telecommunication, Media Entertainment, Natural Resources, Trade and Transport, Government, and IT and ITES) - Global Industry Analysis, Size, Share, Growth, Trends and Forecast 2017 – 2023”.